Every species on the planet has a form of communication using body positions, movement as well as vocalization to express moods. Being aware of body gestures paired with vocalization changes is often a major way to understand what an animal is trying to tell us. Taking your pets "TEMP" and understanding what the tail, ears, eyes, mouth and posture have to say together during a conversation is crucial. It is not good enough to just read one part of the body, all parts have to be considered simultaneously during a conversation. We as humans often miss key components of change when it comes to how an animal communicates, leading to injury of another animal or ourselves. Often animals are labeled as "aggressive" when really they are just afraid, in pain, or are trying desperately to make current actions stop. As you build a relationship with your pet please educate yourself to common communication tools used by the animal so all will live a happy and healthy life. At Hairy Tails Pet Education I will strive to fill this communication void so please let me help you find the needed resources. Often overlooked daily "Exercise & Fitness" is a key concept to the health of an animal. 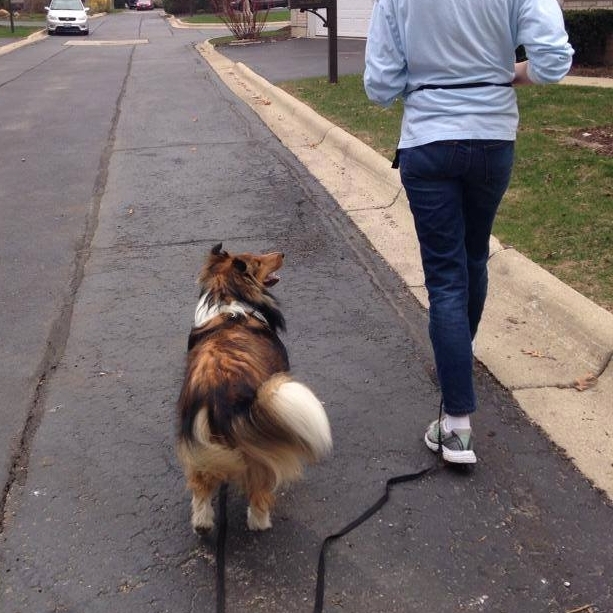 At Hairy Tails I incorporate fitness in all of the activities. Animals improve overall health when a structured 10 to 20 minute fitness session is part of their daily routine. Balanced workouts which provide both mental and physical exercise are a major benefit to all living creatures, humans included. Bringing fitness into an animals life is proven to provide better health benefits than just walking alone. Plus, fitness sessions can be done in less time while providing a comfortable stress free environment or while traveling. Canine Total Health includes the five aspects of: mental, balance, strength, cardiorespiratory fitness as well as flexibility. Each individual aspect of total health plays a varying role throughout the canine life stages and phases of a fitness program. Adding enrichment to your pets life doesn't have to be a difficult task. Try to take one daily task. Changing how it is presented to your pet will work. The easiest task to choose is how you feed daily meals. Food is something all pets receive everyday. You can easily google or search YouTube on creative, inexpensive ways to feed without using a food bowl for a direct deposit of food. Some ideas that come to mind are feeding with a food dispensing toy, buster mats, playing hide'n seek or hiding food in an area to be searched. Puzzles and games help to keep your pet entertained as well as mentally fit. Remember many destructive or unwanted behaviors are generated due to a mentally board animal. Similar to "cabin fever" in humans. For centuries "traditional obedience" has reined supreme as the most required concept of a pets education. Obedience for many consists of commands like sit, down, come, heel and stay. Important as this concept is for allowing owners to keep an animal safe, obedience also forms a communicational bond with the pet. Personally, I feel that if all of the other concepts are worked on obedience will fall in place naturally. The primary driving force of this concept has to be the ability of the pet to "Focus" no matter the environmental distractions on their owners.